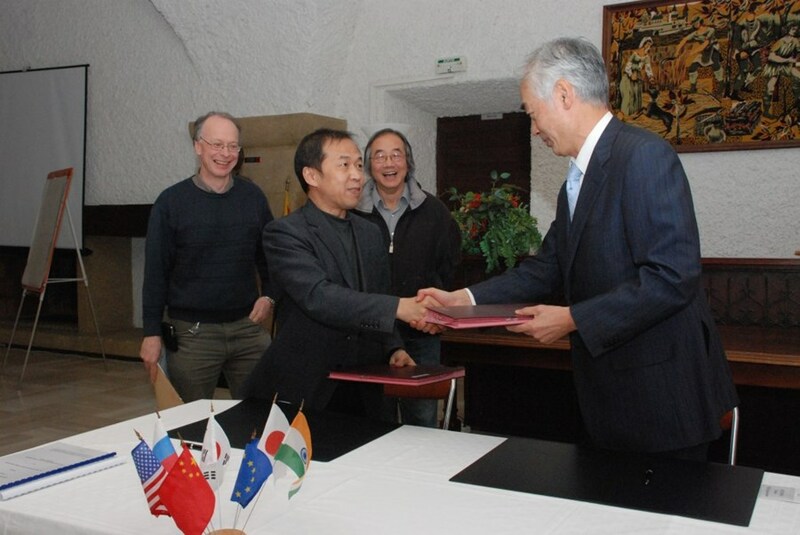 ITER Director-General Osamu Motojima and the Head of the Chinese Domestic Agency, Luo Delong, after the signature. Participating in the ceremony were Chen-yu Gung, Neil Mitchell and Gary Johnson. Feeders convey and regulate the cryogenic liquids to cool and control the temperature of ITER's powerful magnets; they also connect the magnets to their power supply. 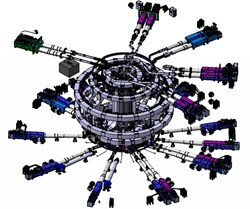 They are not the most "jazzy" components of the ITER Tokamak, but they are vital for its operation. The ITER feeders will be manufactured by Chinese enterprises under the supervision of the Chinese Domestic Agency and are scheduled to be delivered in several steps to the ITER site. The Procurement Arrangement that paves the way for the manufacturing of this system was signed this Wednesday 26 January by ITER Director-General Osamu Motojima and the head of the Chinese Domestic Agency, Luo Delong. In total there will be 31 feeders relaying the electrical power and cryogens through the warm-cold barrier to the ITER magnets. Each feeder consists of three main units: the in-cryostat feeder, the cryostat feed-through and the coil terminal box which provides the housing for the connections of the magnets and 12 other interface systems. The design operating current of the feeders is 68 kA. High temperature superconductor (HTS) current leads transmit the high-power currents from the room-temperature power supplies to the low-temperature superconducting coils 4 K (-269 °C) with minimum heat load. Superconducting busbars—made out of steel conduit containing niobium-titanium superconductor cable—are designed to absorb the large temperature variations during the cool-down of the machine. They also withstand the various Lorentz forces acting on the material connecting the current lead and the magnet. The most challenging issues remaining are the electrical and mechanical designs of the high-voltage insulation. "As a responsible partner of ITER, we are confident to carry out the task and deliver the feeders as well as other procurement packages allocated to China as requested under the strong leadership of the Minister of Science and Technology," said Luo Delong during the signature ceremony. Gary Johnson, Deputy Director-General and head of the ITER Tokamak Department, added: "The signing of this Procurement Arrangement was the result of an excellent collaborative effort involving many within the ITER Organization and the Chinese Domestic Agency. In particular, work on the models and drawings has been going on at ITER and in China for many months and is a model for design cooperation. This is a very critical Procurement Arrangement and an important accomplishment for the project. I offer my congratulations to the entire ITER Organization and Chinese Domestic Agency teams." For Neil Mitchell, head of the ITER Magnet Division, the signature was a mix of relief ... and pride: "This signature brings the total number of magnet Procurement Arrangements to 20, with just one left to go. 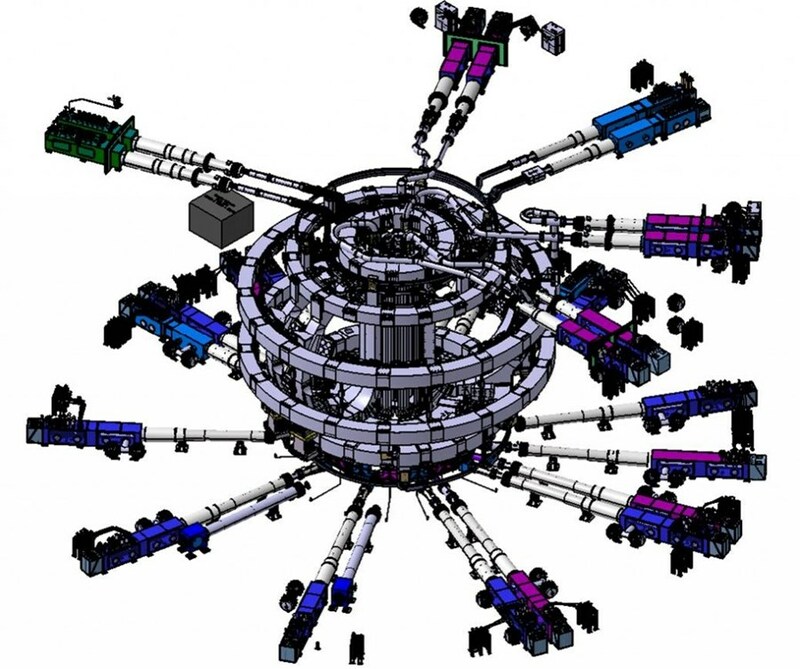 It was one of the more challenging, not because of especially advanced technology, but because of the complex interfaces with many of the main tokamak systems and components. It is a relief to get it to the stage where manufacturing development can get underway in China in parallel with some design refinements to reduce costs."